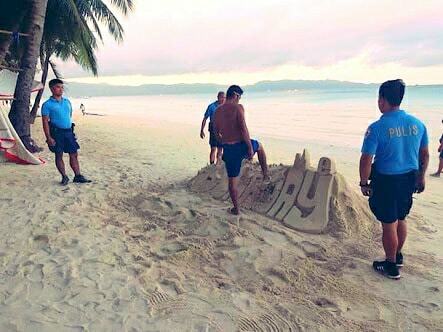 Police in Boracay have launched a crackdown on the illegal building of sandcastles, threatening jail for offenders. Visitors to the white sand beach have spotted officers of the Boracay Tourist Assistance Center (BTAC) kicking down lovingly crafted sculptures under an ordinance passed in 2007. The Malay Municipal Ordinance No 246 includes a ban on the creation of sandcastles to serve as photogenic backdrops for tourists. Senior Inspector Jose Mark Anthony Gesulga, BTAC chief, said his team had been going around the island to check if sandcastle makers were authorised. Anyone wanting to make a sandcastle has to pay for a permit from the mayor’s office. This permit, for “promotion or special events” costs 100 pesos per square metre, per day. Even then, the ordinance limits building to outside a six-metre stretch away from the edge of any vegetation. The builders are also obliged to level the structure after pictures have been taken. Violators face a fine of 2,500 pesos for the first offence, with the threat of up to 30 days in jail for subsequent offences. Snr. Insp. Gesulga said his team had received complaints that enterprising locals had been illegally making sandcastles as photo backdrops. “We received reports that some asked 50 pesos per person,” he said. BTAC had also received complaint from Chinese tourists that they were forced to hand over cash after taking photographs on the beach, even though they were not deliberately in front of the sandcastle. In another, more serious case, some tourists alleged that the sandcastles were exploited by distraction thieves. “While the complainant had his pictures taken at the sand-castle, he momentarily left his belongings. But his things went missing shortly later,” Gesulga said. For destroy a sandcastle need 4 policeman?they have no other work to do.better they check the traffic at the highway and the singel motor how they drive on the walkways.